Juicing is all the rage in alternative health circles. Many are touting the ability of fresh juices made from fruits and vegetables to usher in some impressive health benefits. Top of this list is the ability to help the body detox. “Detox” is an important mantra for those serious about their health. Chemicals are everywhere, and medical experts agree that they’re destructive and bad for us. They screw up our hormonal system, attack our cells, prevent our kidneys and liver from doing their job, trigger serious diseases like cancer, and impair our ability to think clearly. Anything that helps to reduce the impact of chemicals inside (and outside) our bodies is a valuable asset indeed. Juicing has now stepped in to perform this important role. Everywhere you look, you’ll see advertisements for juicers. Some boast powerful motors and others special attachments to better feed the juicer a vast array of fruits and veggies. Gone are the days when orange juice could suffice as a healthy snack. If you’re serious about detoxing, it’s time to get out the kale and ginger. In fact, you could also add beets, celery, parsley, pineapple, papaya, raspberries, blueberries, and cilantro. Along with its many healing abilities, juicing is also promoted for its easy digestibility. Juices, we are told, are absorbed faster and better once inside the body. This means that all the antioxidants like vitamin C and vitamin E can get to work right away. Likewise the same could be said of any of the enzymes, minerals, carotenoids, flavonoids, and other phytonutrients found in fruits and vegetables. Juicing is also suggested for those wanting to lose weight. How fattening could it be to drink fruit and vegetable juice, after all? There isn’t much fat or refined sugar to worry about when drinking a kale/celery/pear juice. But how much healthier is juicing when compared to eating whole fruit? Not much, according to nutritional researchers. Combination juices do contain the same amount of vitamins and minerals and other beneficial nutrients that are found in whole fruits and vegetables. However, juices do not contain any fiber. 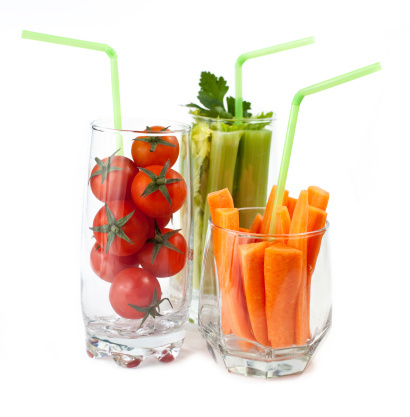 Fiber helps your body deal with the natural sugars you ingest when you drink juices like apple, pear, carrot, or beet. Fiber slows down the digestion of these fruits and veggies, helping to prevent spikes in blood sugar. Eating whole fruit can also help you feel full, curbing the need to eat too many snacks between meals. Juicing, ironically, could lead to weight gain over the long term due to the amount of natural sugars. Eating whole fruit is probably the best choice when it comes to boosting your health. But if you can’t seem to get yourself to eat fresh fruits or vegetables, juicing can be a way to get in some much needed vitamins and minerals. One note about juicing: you need to drink fresh juice right away. Freshly squeezed juice does not keep in the fridge like store-bought, pasteurized juices. Fresh juice can quickly develop harmful bacteria. “Should you juice? Fans of detox diet call it a health ‘reboot’,” CTV Health News web site, Oct. 7, 2013; http://www.ctvnews.ca/health/should-you-juice-fans-of-detox-diet-call-it-a-health-reboot-1.1486615, last accessed Oct. 8, 2013. Lien, Y.H., “Juicing is not all juicy.” Am J Med. Sep 2013; 126(9): 755-6. “Juicing fruits and vegetables. A better way to eat?” Mayo Clin Health Lett. Feb 2011; 29(2): 7.